Description: Feeling chirpy? 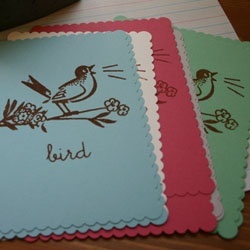 Send off your thoughts on these vintage-inspired notecards. Each notecard is hand silkscreened (by moi!) with this super sweet bird design. Backside of cards is ready for your innermost thoughts! Delicate scalloped edging will make any recipient swoon. Quantity: 5 cards (1 of each color: pool, cream, strawberry, wheat, jade), 5 coordinating envelopes. Other Info: 5.5" X 4.25". Each set is tied with bakery twine and packaged in poly packaging. Custom Gift Tag Rubber Stamp: "Bird"